The Broken Mirror is EverQuest's 22nd Expansion! You can now choose a buff granted by one of your illusions, while gaining the appearance of a different illusion! The entry zone for The Broken Mirror is Plane of Health. This zone can be accessed through Plane of Tranquility, near the Plane of Nightmares zone in. 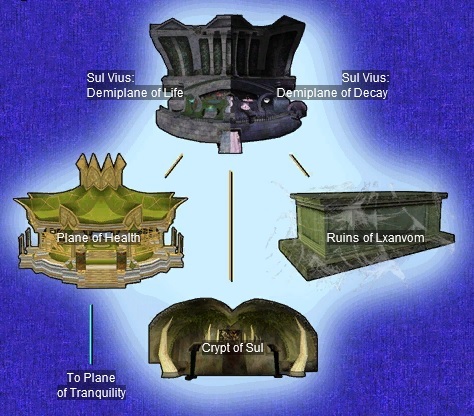 To access Sul Vius: Demiplane of Decay, and Crypt of Decay, players must obtain a Mirror Fragment of Anashit Sul. The mirror is a reward for the quest Into the Temple (b). Group Armor and Gear is done very differently this expansion that what has been done for the past several years. Group Armor and Gear is low stats (300ish HP, Mana, Endurance), and usable at level 75. The Armor and Gear pieces have additional Augmentation slots (Slots 5, 6, and 9). There are varying powers of augs that can be placed into the items, based on the players level. This allows for most of the content to scale from levels 75-105 without the need for several sets of Gear and Armor.